Do you love fresh, locally grown food? 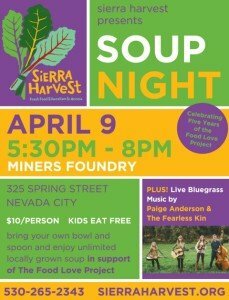 Bring the whole family to the Sierra Harvest Soup Night. Kids eat free! 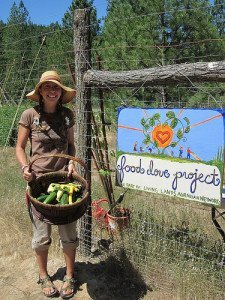 Join Sierra Harvest for a celebration of the 5th season of the Food Love Project on Thursday, April 9, 2015 from 5:30 – 8:00 p.m. at the Miners Foundry. Bring your own bowl and spoon and enjoy a bottomless bowl of locally grown soup and yummy bread for $10. Enjoy live music by Paige Anderson & The Fearless Kin while supporting farm to school education in our community. Enjoy a healthy meal and connect with other local lovers of fresh food! 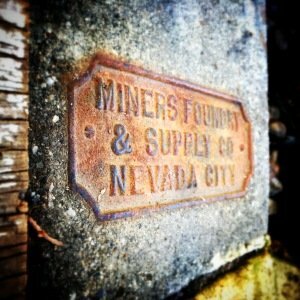 The Nevada City Film Festival and the Miners Foundry Cultural Center are excited to present the NCFF Winter Comedy Show on Saturday, April 4, 2015. 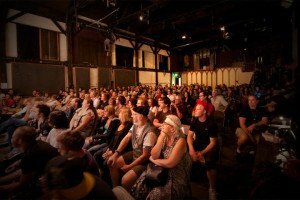 The NCFF Winter Comedy Show will feature live performances from Tig Notaro, Tim Heidecker, Nick Thune, and Sara Schaefer. For this special one-night only extravaganza, enjoy laugh out loud comedy and watch episodes from popular comedy web shows on Adult Swim, plus catch a sneak peak at a new series. Tickets are available online, by phone, or in person at the Miners Foundry, and in person at Briar Patch Co-Op. Ticketing fees may apply. 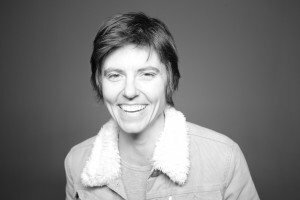 Included on Business Insider’s list of “50 Women Who Are Changing the World” and Rolling Stone’s list of “50 Funniest People Now,” Tig Notaro was nominated for a Grammy Award in 2014 for her sophomore release LIVE. Louis CK is quoted as saying it is one of the best stand-up performances he ever saw. During the release of LIVE, Tig was reviewed and profiled by The New York Times, The New Yorker, Entertainment Weekly, Vanity Fair, GQ Magazine, and Time Magazine amongst many others. More recently, Tig delivered a TED Talk and is writing a memoir, both expected to be released in 2015. Tim Heidecker is a comedian, writer, director, actor and musician. 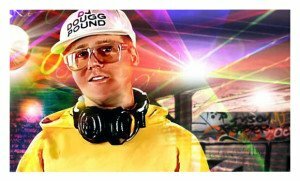 He is one half of the comedy team of Tim & Eric, along with Eric Wareheim. Heidecker and Wareheim are noted for creating the television shows Tom Goes to the Mayor, Tim and Eric Awesome Show, Great Job!, and Tim & Eric’s Bedtime Stories. 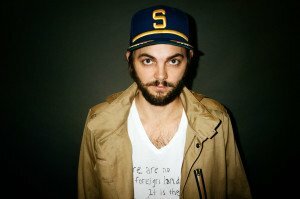 Nick Thune, comedian / actor, hails from the Great Northwest (Seattle), where he spent his early years growing up. Nick’s absurdest view and deadpan wit combined with the soothing lull of his guitar, have distinguished his unique style of comedy. He has appeared on the Tonight Show 8 times, and on each occasion, he won. Nick has also appeared on Conan, The Late Show with Jimmy Fallon and has his own Comedy Central Special. 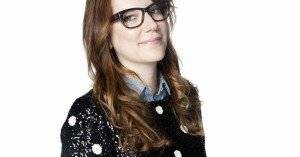 Sara Schaefer is a critically acclaimed stand up comedian, writer,and producer currently based in Los Angeles. She was recently the co-host of MTV’s late night show Nikki & Sara Live. Sara has appeared on @Midnight, John Oliver’s New York Stand Up Show, Late Night with Jimmy Fallon, Best Week Ever, and Inside Amy Schumer. She has won two Emmy Awards for her work at Late Night with Jimmy Fallon. Douggpound’s Video Hole DJ Douggpound (Adult Swim) presents a collection of his favorite hilarious videos made by himself and his friends. Expect lots of sound effects, lo-fi 3D animation, and absurdity. 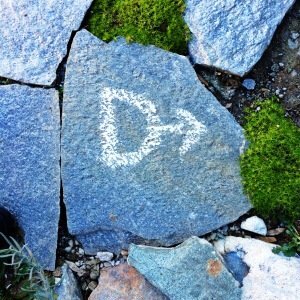 Doug may even show a secret project in the works! 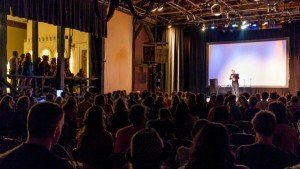 The Nevada City Film Festival is made up of a group of passionate filmmakers and artists that have worked to create an outlet for emerging new voices and ideas while providing audiences with a unique experience in a picturesque location. 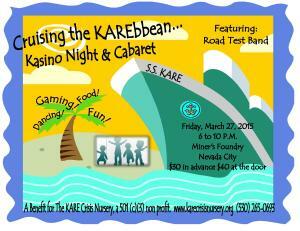 Get ready to set sail on March 27, 2015 when the KARE Crisis Nursery holds its “Cruising the Karebbean Kasino Night” from 6:00 p.m. – 10:00 p.m. Guests are encouraged to break out of the winter doldrums, don their sunglasses and tropical gear, and come celebrate for a wonderful cause. The event will feature the Road Test Band rocking on the Miners Foundry’s dance floor, as well as great food and fun gaming. For more information, call (530) 265-6520 or email karedirector@sbcglobal.net . The KARE Crisis Nursery is a private non-profit agency established to provide safe and nurturing care for the small children of families experiencing a stressful situation. The KARE Crisis Nursery is not traditional childcare, but is 24 hour respite care in emergencies. The KARE Crisis Nursery is a project of Soroptimist International of Grass Valley. 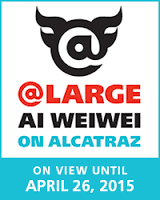 The Miners Foundry, DANK, and Community Asian Theatre of the Sierras are delighted to present an exclusive trip to San Francisco to tour @Large: Ai Weiwei on Alcatraz on Saturday, March 21, 2015. 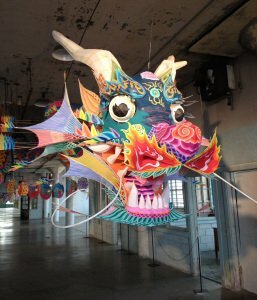 Join us for an afternoon on Alcatraz, a fitting home for Chinese artist and activist Ai Weiwei’s latest project @Large. Working from his studio in Beijing and with part time Nevada City resident Cheryl Haines, Ai created the series of site-specific installations using sculpture, sound, and mixed media. The exhibition occupies three buildings on the campus normally restricted to the public. The day will begin at 7:30 a.m. in Grass Valley, where guests will board a luxury bus and be transported to Pier 33 in San Francisco. During the ride, guests will be treated to a film about the exhibition. 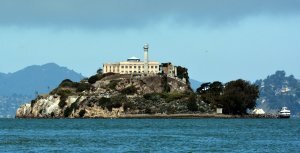 After the ferry ride to Alcatraz Island, guests will be given three hours to explore the exhibit and the island. During the return trip, the bus will stop at Tokyo Buffet in Citrus Heights for a no-host dinner. If you feel the trip would be appropriate for your family, closely supervised children are welcome. 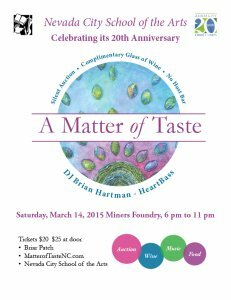 Tickets are available online, by phone, or in person at the Miners Foundry, or in person at Briar Patch Co-Op. Additional details and information will be provided upon ticket purchase. WHO: Presented by Miners Foundry, DANK, and CATS. Tickets available to the public February 2, 2015. WHEN: Saturday, March 21, 2015, 7:30 a.m. – 8:30 p.m.
WHERE: The bus will depart from and return to Grass Valley. TICKETS: $79.00 – $94.00. Ticketing fees may apply. 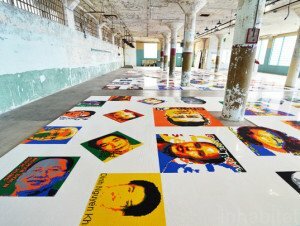 @Large: Ai Weiwei on Alcatraz will feature a series of seven site-specific installations by Ai Weiwei in four location on Alcatraz Island, offering a new cultural lens through which to experience the notorious military and federal penitentiary turned national park. The exhibition explores urgent questions about human rights and freedom of expression, and responds to the potent and layered history of Alcatraz as a place of detainment and protest. 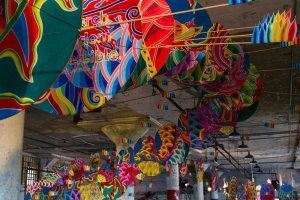 On view through April 26, 2015, @Large: Ai Weiwei will provoke visitors to consider the broader social implications of incarceration and the possibilities of art as an act of conscience. 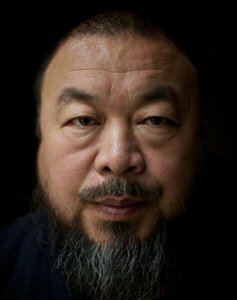 Ai Weiwei is a Chinese contemporary artist and activist. Ai collaborated with Herzog & de Meuron as the artistic consultant on the Beijing National Stadium for the 2008 Olympics. As a political activist, he has been highly and openly critical of the Chinese government’s stance on democracy and human rights. He has investigated government corruption and cover-ups, particularly the scandal following the collapse of tofu-dreg schools during the 2008 Sichuan earthquake. In 2011, Ai Weiwei was arrested and held for 81 days without official charges being filed. Alcatraz Island offers a close-up look at the site of the first lighthouse and US built fort on the West Coast, the infamous federal penitentiary long off-limits to the public, and the 18 month occupation by Indians of All Tribes which saved the tribes. 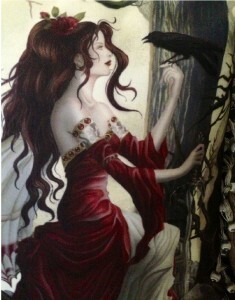 DANK is an artists’ collective in Nevada City, California. It was founded in 2013 by ten artists interested in post-Great Recession social issues, the rural ideal, and an anti-urban aesthetic grounded in the legacy of the California Gold Rush. The name DANK comes from the wet wood smell that permeates Nevada City, a town situated on the banks of Deer Creek. It’s also a nod to one of the area’s premier exports, cannabis. And it’s an acronym; Do Art Now Kids. 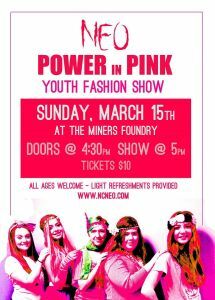 The NEO Power in Pink Youth Fashion Show will be presented on Sunday, March 15, 2015 at the Miners Foundry. Doors open at 4:30 p.m. and the show begins at 5:00 p.m.
NEO provides opportunities for young people to reach their full potential and the skills and confidence to make healthy choices, successfully navigating adolescents. While the focus of NEO is to keep young people drug and alcohol free, we believe that the most effective way to do this is by addressing root causes which contribute to drug and alcohol use and abuse. Because of this we address many issues such as suicide, depression, body image, education, healthy alternatives and community responsibility. Together, these efforts combine to provide a comprehensive, multifaceted approach aimed at building assets and resiliency ultimately reducing overall drug and alcohol use. 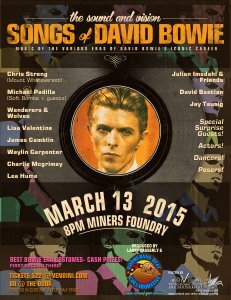 Larry Casserly, Golden Now Promotions, and Boomerang Beat Collaborative will present The Sound and Vision, Songs of David Bowie at the Miners Foundry on Friday, March 13, 2015. Songs of David Bowie pays musical homage to the iconic David Bowie. An All-Star cast of superb musicians from all over Northern California will perform songs from each era of Bowie’s music. The evening will also feature a Best Bowie Era costume contest with cash prizes for the top 3 winners, plus surprise special guests, actors, dancers, and posers! Doors open at 8:00 p.m. Tickets are $22.00 and are available online or at the Door. 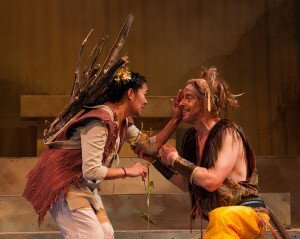 The Miners Foundry is pleased to welcome back HAPA, on Thursday, March 12, 2015. Often encapsulated as the “Sound of Maui” or the “Soundtrack of Hawaii”, the music and sound of HAPA evokes a place many people refer to as heavenly. 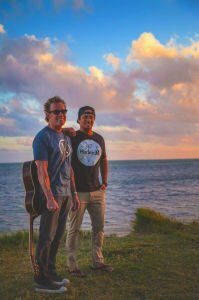 Expect to hear hypnotic, liquid guitar runs woven around clear, tenor Hawaiian vocals and immaculate harmonies driven by poetic lyrics exulting the rapture of the Hawaiian landscape, History,and Mythology. This will be a dancing concert with limited seating. Doors open at 7:30 p.m. and the music begins at 8:30 p.m. Tickets are $25 in Advance and $30 at the Door, and are available online, by phone or in person at the Miners Foundry, or in person at Briar Patch Co-Op. Ticketing fees may apply. 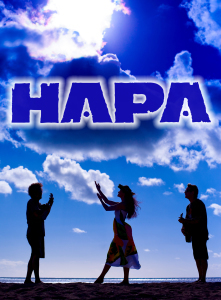 The blend of HAPA’s original vocal sound was originated on a wooden picnic bench in the beautiful little beach town of Lahaina on the island of Maui in the early 1980’s. The overriding quality of their music is one of passion, beauty, and serenity, as found in the majestic tones of the oli (chant), mele (song), and the exhilarating innovative sounds of virtuoso guitar performances. HAPA’s recordings have infused fearless and brilliant production while weaving unique, inventive elements of sound and textures into their intricate South Pacific tapestry. Miners Foundry and Gold Dust Collective will present One Fine Day on Sunday, March 8, 2015 from 12:00 p.m. – 5:00 p.m. 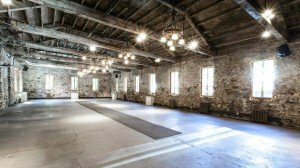 The premiere Nevada City wedding showcase features live music, tasty bites, photo booth, DIY workshops, craft cocktails, styled vignettes, and the best crop of handpicked wedding pros. 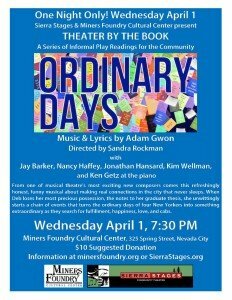 One Fine Day tickets are $10.00 and are available online, by phone, or person at the Miners Foundry, or in person at Briar Patch Co-Op. Ticketing fees may apply. One Fine Day is a seriously fun party!